The History of All Around Sound began while I was working at the Crescent Hotel as a wedding caterer/bartender. I was noticing all the different DJs that were coming in, some having success at the getting the crowd up and moving, and some not. I also began to notice the different equipment brought in, both in audio and visual. Again, seeing what was working with parties and what was not. The thing that inspired me the most was when a specific song would play that everyone knew and they would get excited and have a huge reaction to it by cheering and/or running to the dance floor to move their bodies to the beat and have the time of their lives. It was my dream to be the person who creates that exciting atmosphere and happiness in everyone. Soon After, I got the chance to make my dream a reality. 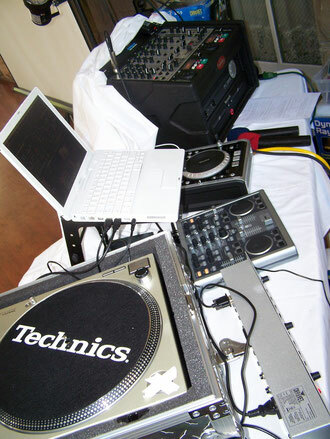 I began to work side by side with some of my friends who were professional DJs working in clubs and at college parties. I was also learning all the configurations of equipment involved to perfect the output of the sound. I was quickly realizing the endless capabilities and options that I could choose from to make my own style unique and perfect. I was still taking note of what was working and not working with the other DJs that would come in and work weddings at the crescent. I began to save money and purchase new equipment piece by piece to build a unique and flawless dj empire. Carefully taking each piece and matching it to equally impressive equipment for the ultimate effect. In 2007, working with the Crescent I began to do small receptions and parties with great effect. I also started doing the music for some karaoke bars throughout town. I had taken all that I learned, as well as my advantage of knowing what worked from other DJs, and gave it my best. I took extra care to avoid mistakes that other DJs were making. The sales staff was very impressed and in under a year I had received the accomplishment of being put on the "Preferred Vendors List" and began working with large parties and events all over the greater Eureka Springs area with the greatest response. Everything was going so well that of all the DJs/vendors to choose from, he was the only one chosen to do the music for the New Years Eve party at the Crescent Hotel. Now, All Around Sound has done events all across NorthWest Arkansas and parts of Missouri. To date we have done events in the Fayetteville/Bentonville Area, Eureka Springs, Conway, Branson, Hot Springs and Springfield. Our DJ empire continues to grow every day. To date we have well over $9000 worth of equipment in both audio and visual effects. All Around Sound's love, hard work, and dedication for making an exciting atmosphere, where people can forget about troubles, make memories and enjoy themselves continues on and on.